Given the market and our turn-key model, our home care franchise business is an excellent opportunity for someone looking to get into their own business. We offer relatively low startup capital requirements and offer tremendous support by seasoned business professionals to help you grow your business. Over the next 20 years, the senior population is expected to double to 70 million, or 20% of the U.S. population1. At the same time, more and more seniors are electing to stay in their own homes for longer periods of time, rather than move into assisted living facilities. 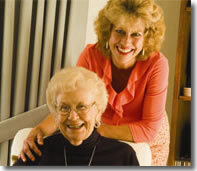 Senior Helpers can help you take advantage of this expanding market and the growing need for senior care services. We offer an affordable way to start your own senior care business in an exclusive, protected territory, which is determined through professional, up-to-date statistical and demographic analysis. Our model is built around the concept of "you're in business for yourself, not by yourself" and is truly turn-key. With our full support, and "fast start" pre-opening package, you'll be able to hit the ground running as soon as you complete our pre-opening task list and the required week-long franchise training session. Your business can be open within 90-100 days after your franchise is awarded! "I love everything about Senior Helpers. I can honestly say I couldn't have picked a better business!" "After a lot of research, I determined that Senior Helpers met all of the criteria I was looking for in a business. They are focused on making their franchisees profitable." Start making a difference in your community. Enjoy the freedom and satisfaction of owning your own business while helping those in need! Click on Request Information button above for FREE information on how to start a Senior Helpers franchise today! Please Note: Senior Helpers franchises for sale, and other franchise opportunities, business opportunities, businesses and franchises for sale on this web site are not to be considered as an "offering", "franchise offering", suggestion or recommendation by GlobalBX. The franchises, businesses and business brokers seen on this web site submit their own individual content. This advertisement depends entirely on the truthfulness of the information provided by our advertisers which includes, but is not limited to, franchisers, franchises, franchise brokers, franchise consultants, business sellers and business brokers. As always, GlobalBX recommends that you consult a lawyer, financial consultant, accountant or professional advisor before buying a franchise or business opportunity or any type of business. By submitting this form and requesting more information, you have agreed to all terms and policies of GlobalBX and the business and franchise offerings listed here. Please review our Terms & Conditions for more information.